Bill O’Reilly and Donald Trump are friends, attending baseball games together and presumably sharing their favorite stories about being repeatedly accused of sexual harassment throughout their public careers. 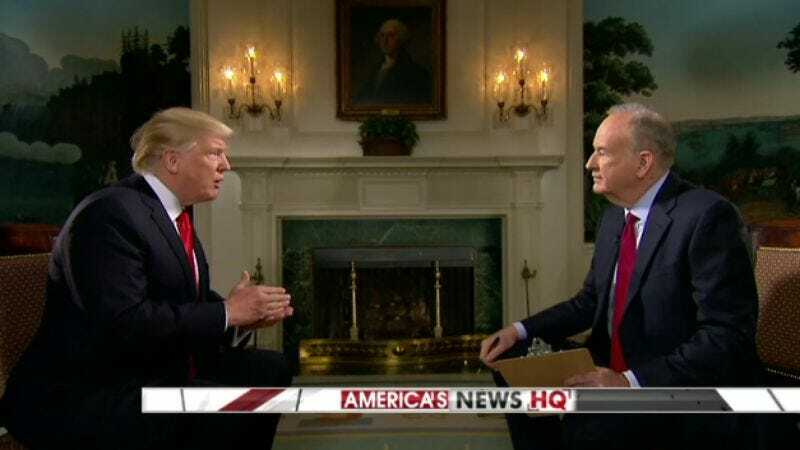 But despite their many similarities, the two men do disagree on a few key issues, as revealed in a promo for Fox’s big Trump-O’Reilly Super Bowl interview, scheduled to air tomorrow before kickoff. The clip cuts off there, so it’s not clear if Trump, like, names names on this cadre of assassins roaming America’s streets, or starts drawing other parallels between the former KGB officer-turned-strongman-and-head-of-state and the American people. “Americans like to ride shirtless on horseback too, you know,” or “Who doesn’t like annexing the Ukraine?” We’ll see more when the full interview airs tomorrow at 4 p.m. Eastern, on Fox.